Water Purification | Repair Management Nederland B.V. This system will be assembled directly after the pump, before the the point where the pipes divide. Desinfection by UV-C radiation kills bacteries, moulds and sporicidal in the drinking water system. Also a protection against legionella bacteries. The waterflow is passing a sediment filter and an activated carbon filter. Due to this there is an important reduction of the level of chemical substansis and provide a neutral taste and odour. The special developed Wyckomar UV-lamps are an absolute killer factor for bacteries, virusses and sporicidal. The special Wyckomar lamps must be replaced after 7000 burning hours or at the latest after 12 months. Wyckomar water purification systems are all made of stainless steel. There are systems available for a flow of 340 liters up till 80.000 liter per hour. Pay attention: only use original Wyckomar filter cartidges for the safety of your drinking water filtration. A safe, effective and easy product. 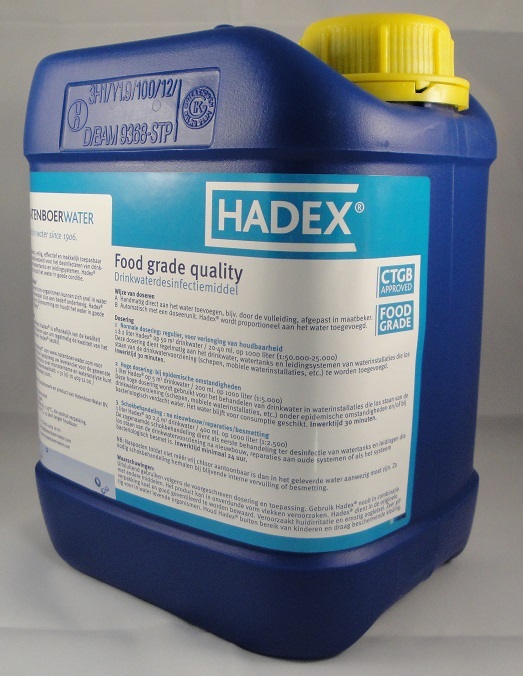 Hadex is especially intended for disinfecting drinking water tanks and piping systems, and for preserving drinking water in tanks. Hadex isa liquid product, which disperses rapidly through the water to be treaded. The water treaded with Hadex remains suitable for consuption, which prevents water being wasted and saves time and money. Hadex is permitted in the Netherlands by the Ministry of Health, Welfare and Sport under permit number 9574N. The Shipping Inspectorate has fully accepted Hadex. For connection direct to the tap point. 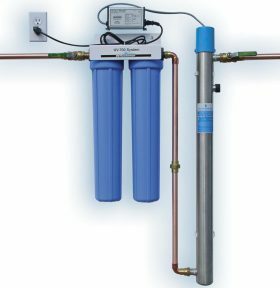 With this filter it provides superior chlorine taste and oder reduction achieving drinking water with a good taste.